An understanding of ‘In the Moment Planning’ would also be an advantage. If you would like to apply please contact us on admin@emps.org.uk for more information and application pack. 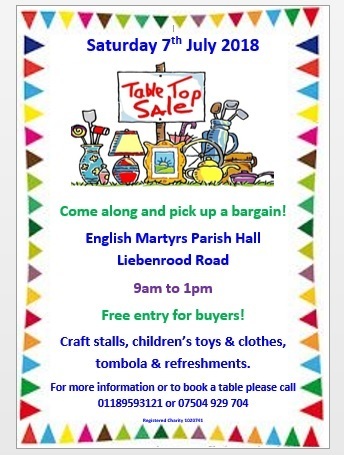 We are hosting a ‘Table Top Sale’ on Saturday 7th July 2018 to help raise money for our annual farm visit and for new Pre-School resources. If you or anyone you know would like to hire a table to sell craft items, please contact us on 01189 593 121 or 07504 929 704. Please add this date to your diary, come along and support your local Pre-School. We are holding our first Open Day of the year on Monday 4th June 2018, between 9am and 12noon. The Pre-School will be closed for an inset day for current families but open to prospective parents so you can see the sort of activities our children get the chance to do. There will be an opportunity to view our facilities and chat to the staff. We will also have refreshments available and maybe even some cake! Please bring your child/children along so they can join in the fun. For more information please call the Pre-School on 0118 959 3121 or email admin@emps.org.uk. Firstly we would like to thank you for being an English Martyrs Pre-School subscriber! We just wanted to let you know that if you wish to stop receiving news and events all you need to do is unsubscribe using the link at the bottom this email or any future emails. Your email address will only be stored for as long as you are subscribed and can be amended at any time if you contact us or removed if you unsubscribe. A little reminder of important dates for the Summer Term. We will be taking the children over to the miniature railway at Prospect Park for some rides on the trains. The morning session will be 10:15-11:15am. The afternoon session will be 1-2pm. Parents are welcome to come along too. If your child doesn’t normally attend a Tuesday session, you’re more than welcome to bring them along but parents must stay with their child. You can meet us at the trains or at the Pre-School before we leave. We will be raising money by collecting reusable clothes. Please help by donating unwanted reusable clothes and accessories. We will be providing bags nearer the time and the collection date is Monday 2nd July 2018. Start saving those unwanted clothes now! If you have any questions, queries or concerns please do not hesitate to ask a member of the team. English Martyrs Pre-School is a committee run Pre-School caring for children aged 2 to 5 years. We are open Monday to Friday, 38 weeks of year (term time only). We are a registered Charity and are also registered with OFSTED and Early Years. You will be providing safe support to a named child under the direction of the Pre-school Manager and SEN to provide safe, high quality education and care for a young child. A satisfactory enhanced DBS check which confirms suitability to work with children. 1 years’ experience of working with young children who have special educational needs. 01189 593 121 or email admin@emps.org.uk and request an application pack. Unfortunately, due to the weather and staff not being able to get to the Pre-School this morning, we have had to close. 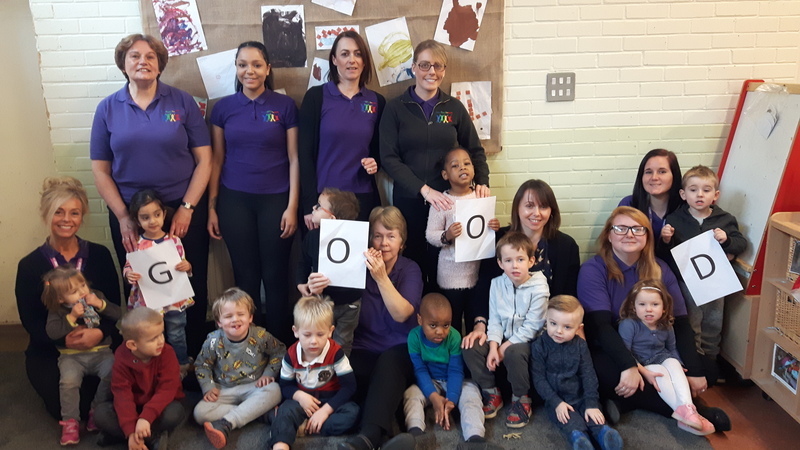 Following our recent Ofsted Inspection on Monday 6th November 2017, we are thrilled to announce that English Martyrs Pre-School has retained a ‘Good’ judgement. We are all over the moon with the inspectors rating and really pleased with her comments and feedback. Our report has been published, so please take the time to check it out! We are pleased to say that all new children have now started and have settled in really well! Thank you all for using the back entrance to drop off and pick up the children. We think this has been working well. We would just like to remind parents of the importance of safety in the carpark and of the children’s safety whilst waiting to be dropped off. We have had reports that some children are running freely and unsupervised around the rear carpark area whilst waiting to be dropped off. Please can parents ensure that their children are supervised at all times. We have also had reports that some cars are coming around to the rear parking area at a fast pace. Please can we ask that you take care whilst driving around to the rear carpark. Thank you to those of you who have brought in or emailed family photos. The board will be in the setting as from this week. Any photos that haven’t been brought in can always be added to the board as and when. This will be a great way to promote communication and language to the children, as many of them will love to talk about their families and home life. Some Baseline Assessments have been completed last week. The remainder will be completed this week. Thank you to those of you who brought back your highlighted forms. These forms were used/will be used alongside staff’s knowledge of the children so far to complete the assessments. If you have any questions please speak to your child’s key worker. We have placed a tree in the setting next to the office with apples on it. On each apple there is an item that we regularly use for the children from food we offer at snack time to cleaning products we use. Please could we ask that if you are able to, that you pick an apple from the tree and purchase the item on the apple along with your own shopping to bring into Pre-School as a donation. A HUGE thank you to those of you who have taken an apple and donated an item!! Your help and support is greatly appreciated. As the weather gradually gets colder, please provide your child with suitable clothing e.g. a warm waterproof coat, hat, gloves, scarf, wellies etc. We would just like to make parents aware that children have access to the garden at all times during the session and can choose to go outside whenever they wish, even if it’s raining. The only time we would close the garden is in the case inclement weather such as excessive rain, high winds, thunder storms and snow storms etc. Please could we remind you to make sure you bring spare clothes for your child every session. This can be put in a backpack or bag and hung on your child’s peg. Sometimes children get wet/dirty after playing outside or they may spill water on themselves or have an accident so we would like them to have spare clothes at all times to change into, just in case. Can we also request that if you have borrowed any spare clothes belonging to the Pre-School that you wash and return them as these are often needed for other children. If your child is absent from Pre-School, please can we request that you call as soon as possible that day to inform us of the absence and the reason why. We do monitor absences closely. Please let us know either in person or by telephone if you have arranged for someone else to collect your child other than yourselves or a familiar person. Ideally we would also like to be introduced to the person beforehand, but understand this may not always be possible. The person will also be asked for your child’s password; if they don’t know the password, we will not release your child to them. Please could we ask that if you put grapes in your child’s lunch box, please can you chop them into smaller pieces or even in half? We are concerned that some of the children may struggle with the bigger whole grapes and this is a potential choking hazard. Please could we also request that your child’s lunch contains no peanut or nut products such as peanut butter. Please remember to follow us on Facebook! Welcome back to a new week here at the Pre-School. We are so pleased that our older children returning from last year have settled back into the routine very well. We would like to give a huge welcome to our new children and their families who have also all settled in so well. This week we are still visiting new children at their homes before they start with us. We would like to make a board with photos of all our children with their families. There will also be a map of the world and flags from all the countries that our families originate from. This will be a great way to promote communication and language to the children, as many of them will love to talk about their families and home life. Please could you provide us with a photo of your child with their loved ones for the board? Once all the new children have started, key workers will be completing ‘Baseline Assessments’. We would like parents to be involved with this process, as you know your child very well already. We will be handing out a document called ‘What to expect, when?’ We would like parents to highlight in yellow high-lighter, the areas that you know your child is already capable of doing. If you are unsure of how to complete this, or if you have any questions, please speak to a member of the team who will be happy to help. We have an tree in the setting with apples on it. On each apple there is an item that we regularly use for the children from food we offer at snack time to cleaning products we use. Please could we ask that if you are able to, that you pick an apple from the tree and purchase the item on the apple along with your own shopping to bring into Pre-School as a donation. Your help and support is greatly appreciated. If your child is absent from Pre-School, please can we request that you call as soon as possible on 01189 593 121 that day to inform us of the absence and the reason why. We do monitor absences closely. Enter your email address to subscribe to the News section and receive notifications of new posts by email.